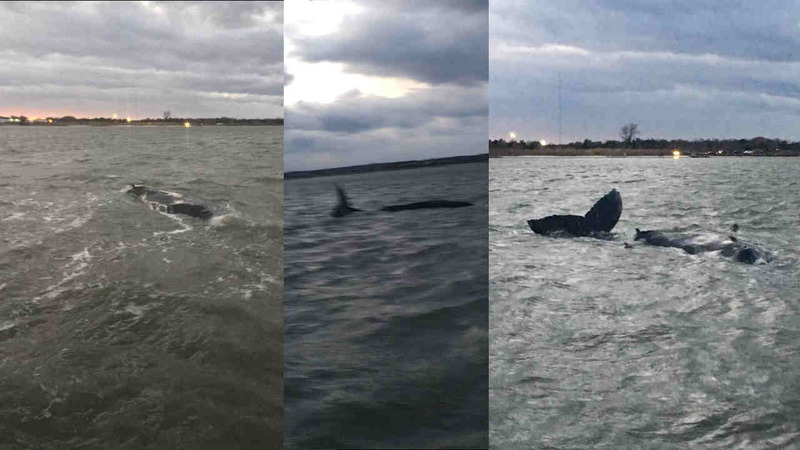 MORICHES BAY, Long Island (WABC) -- A young humpback whale that's been stuck on a sandbar off Long Island for days has been euthanized, officials said Wednesday. The National Oceanic and Atmospheric Administration said the whale was put down Friday afternoon. It had been stranded in Moriches Bay in about 1-to-2 feet water since Sunday. "The veterinary team assessed the animal this morning and determined it was thin, limp, weak, minimally responsive, had evidence of neurological abnormalities, and extensive skin injuries with evidence of infection. Based upon these findings, the most humane option was to euthanize the whale since its chance of surviving in the wild was minimal. The whale was successfully euthanized using injectable medications with the time of death being approximately 1:20 p.m."
NOAA said the whale will soon be moved to a safe location for necropsy. They hope to figure out what caused the whale to become stranded and see what they can do differently in the future. "Generally speaking, when large whales strand (even if they were previously observed feeding), there may be underlying health issues such as illness or malnutrition. Thus, refloating a large whale may not be in its best interest, as it is already sick," said NOAA in a news release. Anyone who spots a stranded whale should contact NOAA at 631-369-9829.